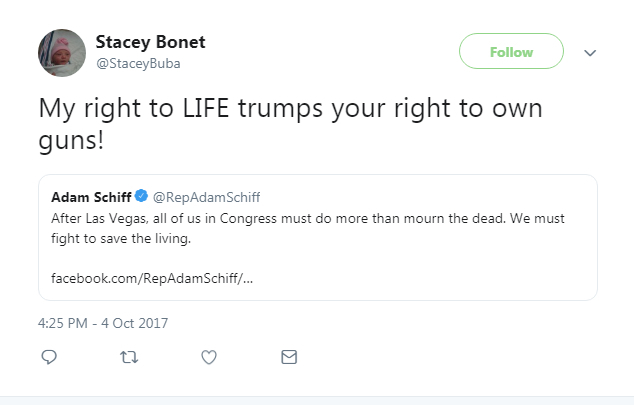 "My right to life trumps your right to own guns." | Eagle Gun Range Inc. This statement in the title, or some variation thereof, is the tyrannical left’s favorite non sequitur bludgeon at the moment. I see it used all the time in public discourse and, unfortunately, I seldom if ever see anyone challenge the utter lack of logic and morality the statement embodies. As we’ll learn in the body of this article, the fact that anyone holds with such a statement is an indictment of their morality and intelligence. It also very clearly describes the battle that leftists desperately want to have with their fellow citizens; a battle that perverts the definition of rights and destroys liberty. In short, leftists want to do with rights what they do with everything else: distort first the language then the ideas, and then based on that distortion pit one arbitrary group against another in order to create a chaos that can only be addressed (they say) by a totalitarian web of immoral, unjust, and increasingly draconian laws. In the end, tyranny is defined as justice. It’s all sounds very dramatic, but it’s the template the left has ever employed. We’ve seen it play out time and time again throughout history and the results are always the same. The United States was, in fact, founded in to be the exception to these examples seen the world over. Yet leftist tyranny has grown apace even here. As always, the prelude to genocide begins with disarmament. The very clear fact is that despite the left’s clever slogans and emotion-fueled demagoguery, our rights are never in conflict with one another. And because of the nature of rights, they are never in conflict with anyone’s safety. Therefore, whenever an argument is made to the contrary, the basis of the argument is quite obviously false. Even so, in order to fully understand the illogic and immorality of the “my right to life/safety trumps your right to guns” statement one needs to understand what a right is. A right may place no obligation on any other individual. For example, supposed rights to healthcare or to housing or to food are not rights because they each place an onus on another individual to provide them. A right may not violate another individual’s rights. A right to healthcare, for instance, would force a physician to provide a service, violating his right to liberty; to dispose of his genius and effort as he sees fit, and at the price he decides. Rights are possessed only by individuals; we each have all the same ones. For example, any “rights” that are for a special class or group of citizens (e.g. women, voters, migrants, etc…) are not rights because there are no such things as group rights. A right held by a group can come only at the expense of individual rights. If a supposed right fails any of these tests, it is not a right. Instead, it is tyranny. This is a fact that most leftists ignore or even deny and it leads them into illogical and immoral arguments. One reason leftists ignore these facts is that a leftist’s morality does not allow them to recognize as legitimate any idea that prohibits conquest or slavery. I don’t say that to be critical; only to be accurate and factual. All leftist ideology is built upon the foundation of conquest and slavery. Proclaiming this right implies the requirement others provide it; a disqualification. Though you do have a moral obligation to provide for your own safety. And it is people who are violent, not guns or other inanimate objects. Feelings, being fictions invented in your own mind, are irrelevant with respect to rights—and in all other respects outside of your own mind. You have the right to pursue happiness, but that’s your business and no one else’s. There IS, however, a right to life! Your right to life is component to fundamental morality, which is the right of every individual to his/her own life, genius, effort, and the fruits thereof. Yet in order to be maintained, and because there is evil in the world, one must sometimes defend one’s life. The responsibility for that defense is each individual’s own; one may not, morally or by right, hold another responsible for the defense of one’s life. An obvious reason for this standard is that no right may place an onus on any other individual. By this standard alone, your right to life is yours to preserve and defend. No other individual can be held responsible for your defense, for to do so would be to transform a right into a tyranny and, therefore, a moral violation. This is why our right to arms is inalienable; because—along with intellect and reason—arms are a human’s means of defense. To deny arms is to deny the means for defending life and property. Such a denial, then, is tyranny and as such, immoral. Yet leftists argue that this right must be denied because it conflicts with other rights. Because leftists deny the idea of personal responsibility, their personal safety ostensibly becomes an issue for someone else to address and to which all must contribute since, in their flawed ideology, safety is a right. 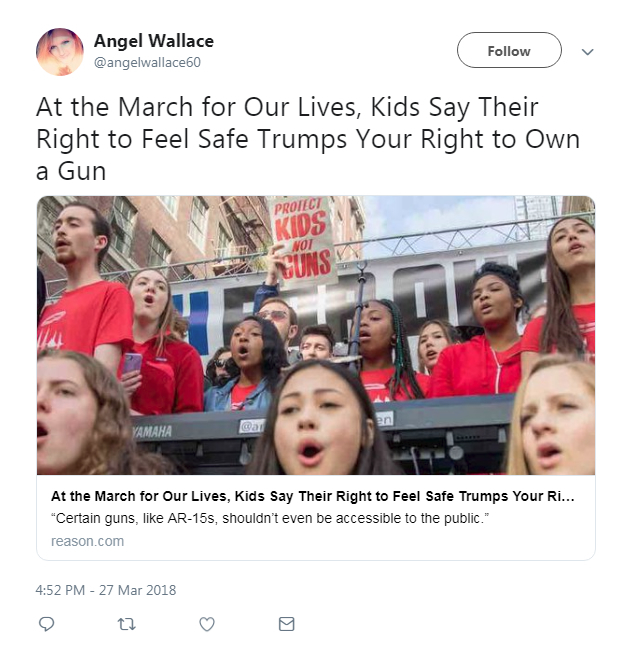 By flawed leftist logic, if you possess anything that could be used to endanger their safety, you are violating their rights and The State must do something about you (must bring force against you). For safety. “Safety” is the primary talking point keyword in the left’s battle against liberty. 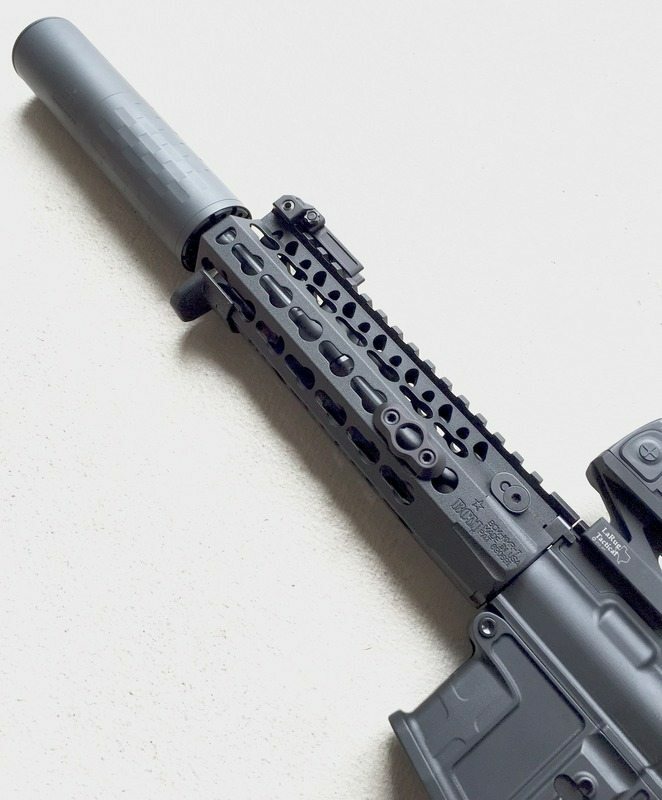 Leftist operatives use this term and its perverted ideal in every battleground: Safe Spaces at universities, Everytown For Gun Safety is the left’s primary anti-gun organization (and, no, they do not teach or even talk about firearm safety) …every argument against the inalienable right of gun ownership these days is primarily based on the idea of public safety. 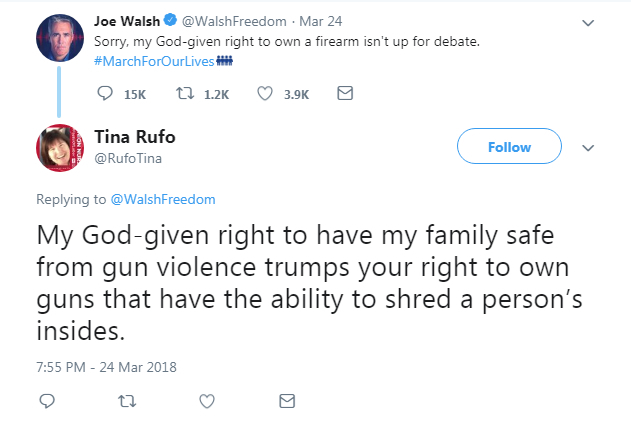 In their arguments, the left elevates safety to the ridiculous and impossible status as a right; a right that they say trumps your authentic, inalienable rights. Yes, their argument is and always will be that your rights must give way to their dominion. In fact, every reference to “gun safety” that you’ll ever see these days in the mainstream media—printed or broadcast—is used to mean a denial of inalienable rights. These references have nothing to do with safe gun handling habits. In this manner they’re changing the common parlance in an effort toward tyranny. Those who mean to rule you first pervert language so that every communication is an effort to get you to question your own sanity. 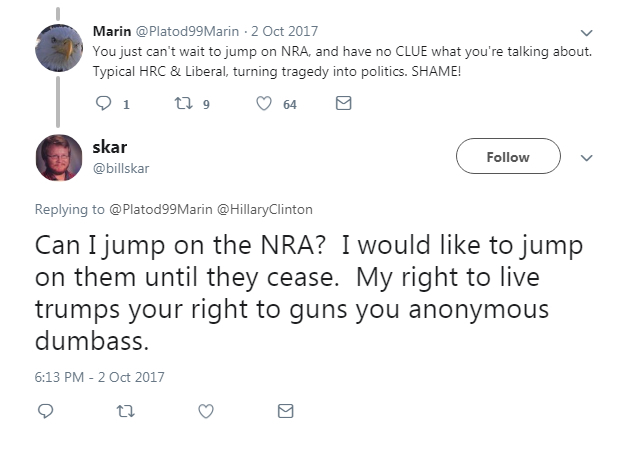 The essential leftist argument is, “My life is in danger merely because you own firearms.” It is ridiculous and false, of course, but that is their thesis; that rights are in conflict. Due to their very nature, rights can’t be in conflict. Moreover, to suggest that one is endangered because someone else is armed is to say that all must render themselves defenseless…which is to say that no one has a right to defend his or her own life. That idea has an obvious conflict with reason and morality. Such an idea is the same as saying that weak people are in danger merely because others are strong. It is the same as saying that the rights of irresponsible people are violated when others behave responsibly. It is logically the same as saying that to possess food is to cause obesity in others. Like everything else the left professes, it is all illogical idiocy. 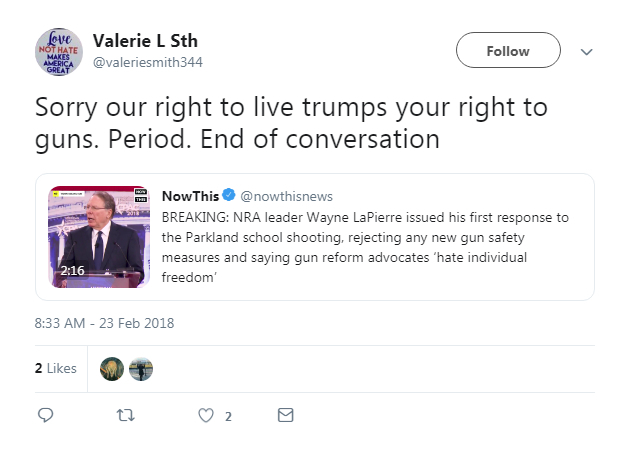 So, no, as an objective and moral fact, no one’s right to life trumps your right to own guns. Owning guns poses no threat to anyone’s rights or safety or liberty or pursuit of happiness. Our inalienable rights are never in conflict and none trumps another. It is the inviolate recognition of our inalienable rights—all of them together rather than some and not others—that defines moral governance. Our rights never change; only the legitimacy and illegitimacy of our government. My right to life trumps your right to bear arms? OK so ,a person using there right to life breaks into my house and tries to better there life by taking my stuff that I attain for the pursute of my happiness, I then use my right to defend my life and stuff and happiness. With my right to bear arms and “and if need be” end the the life of the person that’s trying to better there right to life by taking my stuff. But I’m the bad guy? For not letting the guy take my stuff. It is an absolute tragedy when inoscent people die, no matter what the cause ,but just think about this,there are millions of gun’s in the states,of which are owned by both law abiding citizens and criminal minded individuals, if the there is a ban ,it will only affect the ability for the law abiding citizen the defend themselves, it will not ever decrease the crime and murder rate ,it will increase the crime and murder rate, because the inocent will not be able to defend themselves thus creating a perfect environment for unchecked lawlessness, and I know it’s already really bad, but how bad do you think it will be if they institute complete disarmament? Do you really think American’s will hand over there arms ? 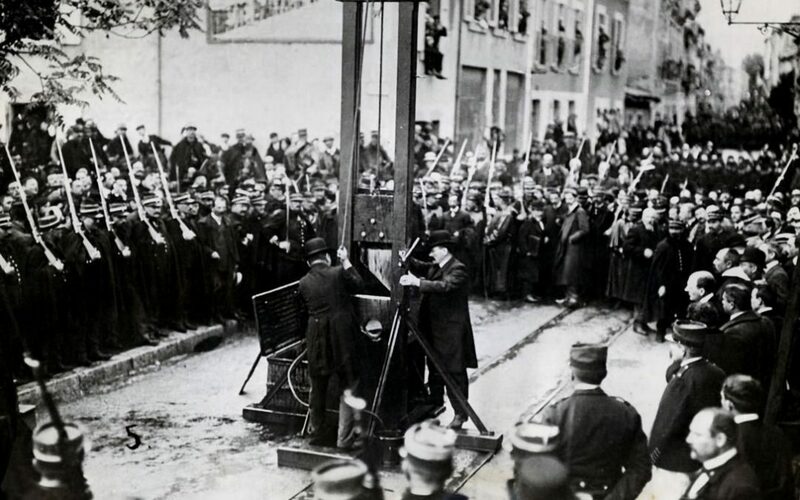 Even though throughout history when people did this there governments then proceeded to take there rights away? Do you really think they will stop with our right to bear arms? Next they will go for the media ,then freadom of speech ,then religion ,then everything everyone who ever fought and died for to defend all of those rights will be in vain ,If you really chearish your right to life ,stand strong with those who have the ability to deffend it.with those who bear arms. Andy, if you see this comment, I’d love to talk with you to better my understanding of the commonly held right to life in context of defense against someone trying to murder me. I’m not a leftist. I’m mostly a conservative with an imperfect libertarian slant on drug laws. I’ll try to spare you more background and stay focused unless you’re curious or the conversation leads to that. -We each get/use our own ammo unless we try out each others’ guns (don’t have to!). Please contact me at 9402104684 if you’re willing to do this or a variation. Great read, Andy. Once again you’ve hit the nail on the head and exposed the leftists for who we already knew they were. Thank you for your insight on these subjects.